Having the right data on your customers can be essential when doing business. This could cover segmentation tasks, having the right contact data or the professional look of having the right data on invoices and invitations. However, maintaining such data can be time consuming and trivial. To ease the process we have made a workflow in Alteryx that takes the CVR numbers of the companies you would like information about and return their data from CVR. We use the CVR API to gather the data. 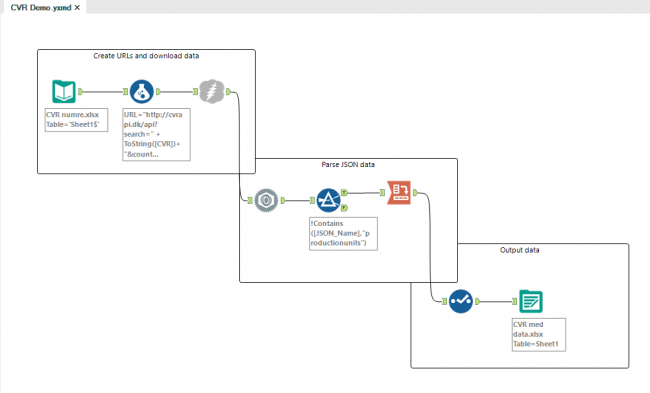 Parse the returned JSON (For more info about JSON parsing see our blog post "FIT(BIT) YOUR JSON DATA IN ALTERYX"
It is possible to download a 14 day trial here and the module can be downloaded here.